By Peter Anderson 40 Comments - The content of this website often contains affiliate links and I may be compensated if you buy through those links (at no cost to you!). Learn more about how we make money. Last edited November 17, 2018 . In a post a while back I talked about how I was able to make some extra money using CashCrate.com, and how you can do the same thing. I've now been with the service for over 4 years, and I'm still earning a check every month. This past month I made $366.77 just by filling out surveys, and also by referring new users to the service. Not too bad for something that doesn't take much time. In my review of the service I didn't get very detailed on how to setup your account and get started earning money, so I thought today I would take moment to walk through the process in a little more detail for those of you who would like to give it a shot. Don't worry, it isn't very hard and you can be earning your first dollar within minutes! Here is a quick step by step guide to getting started earning your first dollar using Cash Crate. Get a new email: First, sign up for a new free email address at a website like Hotmail.com or Gmail.com. You will be getting a ton of email after signing up and filling out surveys, because a lot of what you're doing is getting paid to get on someone's mailing list. An example email you might set up could be “cashcratesurvey@gmail.com”. Make note of what your new email address is. Sign up for Cash Crate: Sign up for Cash Crate by clicking on this link. It will take you to a page where you'll be asked for your basic information including email address (use your new one) and a password. Once you click on the “Join Now!” button as shown in the screenshot, it will ask you for your mailing address as well so that they can send you your payment. Currently payment is made only by check. Start making money by filling out surveys and accepting offers: Once you've signed up for the service you can start making money right on the first day in a couple of different ways. First, you can fill out surveys. Just click on the link on your dashboard that says “complete offers” and it will bring you to a page where you can start filling out surveys for cash or for points (points can be redeemed for rewards like Itunes gift cards, Starbucks cards, etc).On my first day using the service I chose to just complete the “cash offers”, that were 100% free. Those offers will pay out a certain cash amount (which it will show under the “payout” heading) and don't require you to pay anything up front. Other offers may have higher payouts, but they may require you to use a credit card to sign up for a trial offer, or to pay for a month of service (like one available netflix offer). Offers can be as simple as filling in your email address (once again, use your newly created email), and as complicated as filling in several pages of survey questions.One thing that I've found extremely helpful in completing offers quickly is using an autocomplete form filler like Roboform. Basically what this program does is automatically fill out the forms for you so that you don't have to manually enter all of your information every time you fill out a survey or trial offer. Just make sure the information it is entering is the correct information because sometimes it will fill in something that isn't quite right – putting the right information in the wrong field.Once you've filled out the survey or or completed an offer, just click on the “submit” link in the Cash Crate window next to the offer you completed. Your submission will then be added to “pending” payouts, and will be verified. If you didn't complete enough of an offer, it will be rejected, so be sure to fill it out completely. 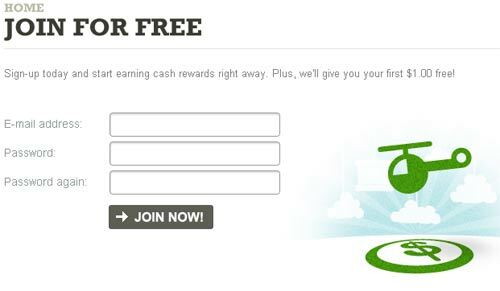 Some of the other offers include offers that allow you to get payouts for clicking on a referral link when shopping. For example, I took advantage of a deal through Vista Print that allowed me to get 250 free business cards (with my blog name/url on them). All I had to do was pay shipping. The shipping cost about $5.75, and my payout from Cash Crate was about $5. So for 75 cents I was able to get a big box of business cards that I can hand out to people I know, and leave at store bulletin boards etc. Not bad for a little bit of blog publicity! 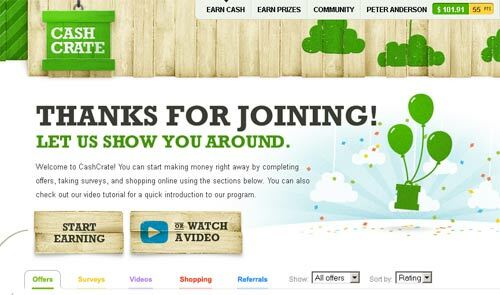 Earn money through referrals: You can also earn big money at Cash Crate using referrals. For every new user that you refer to the service, you'll get paid a small amount for surveys that they fill out, as well as getting a $3 bonus when they complete enough surveys to reach their first $10 payout. If you have a blog you can promote the Cash Crate site and link to it using your personal referral link. You can write a post (like this one) explaining the site, and referring people to the service. Once you get enough people referred to the service the payouts can be quite nice! It's how I make most of my money through them now as I haven't been filling out surveys for a while due to time constraints. So there you go, a quick and easy way to earn a few bucks. Sign up for a new email address for spam emails (technically not spam since you're signing up for them). Sign up through my referral link. If you have questions, or problems, feel free to contact me through the “contact” link at the top of the page. Leave a comment and let me know what your experience has been with Cash Crate, I'm interested to know! Last Edited: 17th November 2018 The content of biblemoneymatters.com is for general information purposes only and does not constitute professional advice. Visitors to biblemoneymatters.com should not act upon the content or information without first seeking appropriate professional advice. In accordance with the latest FTC guidelines, we declare that we have a financial relationship with every company mentioned on this site. Sometimes this link gets broken and puts you on a 404 error page. If that happens, then just copy and paste the whole link above in a new web browser page. I have been struggling with Cash Crate recently. I have over $50 sitting in the waiting to be reviewed bucket. I am not sure what is going on lately but nothing is getting moved over to the other category. Do you have this problem? Not sure what I am doing wrong. Yeah, I’ve had this problem for a little while. Eventually they moved over or were denied because I hadn’t gone far enough in the survey or signup process. It did take a while for some of them though. This cash crate website concept reminds me of alladvantage.com that came out around the year 2000. Does anyone remember that? They were defunct within a couple of years. Let’s hope that cash crate lasts longer. I keep seeing all this cash crate hype, it seems that the way to make real money is the referrals. @Kelly – In that way it is pyramidalish like the surf for cash sites. Do you think that the actually survey provide any type of ROI on your time? Cash crate does work…I have been “doing it” since July and here is what I’ve made each month: 13.30,19.35,14.20,26.65,36.50…. They changed one thing recently, you must have 20.00 in your account every month to get the payout, otherwise your money will roll over into the next month. It’s a good way to make a little extra money, I don’t do referrals at all just the free offers and an occasional survey. A bit of advice, you must open a new e mail addy for around every 4 or 5 offers you complete…and clear your cookies after completing each offer! This really helps a lot! hi im very new to all this, u said to change email id every 4 to 5 offers i COMPLETE . How can i do that i didnt understand that part. Can u plz explain this througly. HELLO EVERYONE. I AM A NEW MEMBER AT CASHCRATE AND I WANT TO KNOW WHAT SHOULD BE THE FIRST STEP I TAKE. WOULD APPRECIATE ADVICE. To get started, after you do all the stuff above, I would start by doing a few of the cheap .25-.50 cent offers. The surveys usually aren’t too hard, and are usually pretty good about moving from pending to the earned income. Good luck! I have filled out many forms, got to the phone number box and it said invalid for sip code. I am using K7 for an online phone number. Anyone know how to get around this? I definitely recommend cashcrate, I have used this site several times and I have made a pretty penny out of it. I am waiting for pending offers and they haven’t gone through in over a week. Is this usual or did I do something wrong? I’m sure you’re doing nothing wrong, some offers take longer than others to confirm. If you’re patient they almost always go through. Good luck! CashCrate has come a long way in becoming a place that anyone can make money. As long as you dont expect to get rich joining cashcrate can be a great opportunity. I am an english user of cashcrate and was wondering if they still send money to english users and how long would it take ? Happy Rock raises a good point. is it worth the time? As anyone calculated a $/hour or something? PS: Just found the blog, nice work! Wow – I haven’t heard of cashcrate before – Ill have to give it a try. Always interested in earning a little extra cash. Ive been using CashCrate for over a year and I absolutely love it. By spending an hour online per day, I am able to earn around $100 per month. Thats perfect for a teen like me who doesnt have much time to get an actual job. @ 2 Million: I think it is kinda fitting that you join CashCrate, because they recently reached the 2 million member mark. Pretty amazing for an online money making site. I personally really like Cashcrate, it’s in my top 5 favorites and it’s a great way to supplement your income. I used to do a survey thing online for money, but it seemed I would have to do about 30 surveys ranging from 5 minutes to 30 minutes before I could earn about $5. Can you make money quickly with these surveys? I have filled out all the offers but only like 10% of them actually work, this is fustrating, it tells you to enter a sweepstakes and then youre filling out 30 pages and they still dont credit you. WHAT DO I DO? I cant take this I have $5500 worth of student loans to pay back, how do I get the offers to work anybody please? I have a cashcrate account. Can my husband start an account also. We use the same computer. I would think that you could as long as you’re using separate email addresses? I don’t know for sure though. I am concerned that cash crate will cost ME money. I am almost down with the sign up process but I was told I had to set up a fedex and ups ‘personal’ account first. When I tried to do this, fedex told me they needed a credit card number from me to set up the account and I had to pay for shipping out the envelopes. i asked cashcrate and did not understand this process. Can anyone help please? Im 62 and need money, but certainly not to pay it out? I don’t think you should have to sign up for UPS or FEDEX to become a member of cash crate. Are you sure you’re not doing one of the offers? Some of those may require a purchase or trial period, but you’re in no way required to do them? I recently made $20 on Cash Crate. It took a really long time (plus the surveys take forever), but I am interested in referring friends which from I can see is where the money is made. 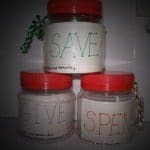 I also run a blog and was wondering how I can get my offer on Cash Crate. For example, I would be willing to pay $0.25 to anybody who likes my page on Facebook, follows me on Twitter, and signs up for my mailing list. It would take about 10 seconds to make that $0.25. Cashcrate is awesome, it’s the first place I’ve managed to make money online. Realistic amount of cash every month. great for anyone, ideal for highschoolers. I’ve gotten 4 checks from CashCrate personally, and I’m going to get the biggest one yet this coming month. I’m up to nearly $60, and have done very little work to get it. If I can get this much every month, it will be a nice way to help the monthly income. I’ve made a TON of money over the past two years with Cash Crate – definitely recommend it.I have made close to $3000 using this great Get Paid To Site. The amazing part is I’ve spent only about 6 hours a week on this site and I’ve earned $300 in 1 month! I can’t urge you enough to try it out for yourself. Could you give me some actionable tips as to how did you make $300 a month? Every time I try to fill out a survey it makes me answer a bunch of questions, then says in not eligible for that survey. It has happened on the past 6 I tried. I feel as if I’m wasting my time. Please Mr. peter i’v checked my dashboard and i’v seen anything like “complete offer” as you said. But i’v seen a lot of job queuing up when i click on them they will take me to a singup page. How and where do i click to start taking the survey in cashcrate? Please help. In my dashboard I see several tabs with things I can do. I can complete offers, do surveys, top surveys, referrals, videos and more. To do surveys, click on the surveys tab and get started. Depending on which thing you click on you’ll be doing a different task. Good luck! However, you should add some disclaimer that in some of the offers, Cashcrate asks for your phone number and eventually, they will ask if they want any particular offer to charge any amount which they will receive in their monthly phone bill. Granted that not every offer is like that but still there are such offers so one should be careful about them. I’m not suggesting not to try this online income opportunity. I’m saying is that just be careful. hi ! i have a question , how to move my money that i have in cashcrate into paybal or visa ..
Next Post: Are You Building Your Credit, Or Just Going Into Debt?